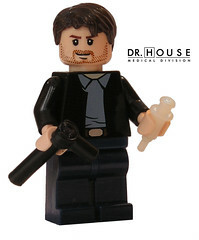 I’ve actually been planning a House custom minifig myself, just waiting for the Lego parts, but I was always stumpt about what hair to use, this version however really got the hair right, which is really nice, House’s signature cane is custom made, and the minifig scale syringe is from Brick Arms, i reckon what would make this custom minifig better would be a white board, with the term “lupus” on it…can you tell I’m a fan of house? a very simple custom job on these minifigs, add some brickarms guns a custom decal and what appears to be some sort of sponge and you have the two lead characters of pulp ficton as custom minifigs. This wonderful timeline tracks the progression of Lego from its initial inception in 1932 as a Business concept to the 1958 invention of the Lego brick with it unique and patented Stud and Tube coupling system. Along the way Is the 1978 invention of the first Lego Minifig which eventually spawned the custom minifig movement and the 1999 launch of the Lego Star Wars range, possibly one of the most successful Lego ranges. Whilst this site is about custom minifigs rather than Lego mocs, on my search for amazing custom Lego minifigs, i came across this custom Lego police station packed with all sorts of amazing detail, I simply had to share it with the readers of custom minifig, if only to wow you with the sheer amount of detail and effort thats gone into it. Aside from being impressive, there are several custom minifigs within the building and an extensive armoury choaked full of Brick arms custom minifig weapons, the Lego custom police station was made by laureano.